Hutchinson is introducing a new dry-conditions specific enduro and downhill tire combo with some interesting characteristics — and a pair of Enduro World Series race podiums to back them up. The Hutchinson Griffus Gravity are big and meaty, and designed specifically for rough, arid conditions. 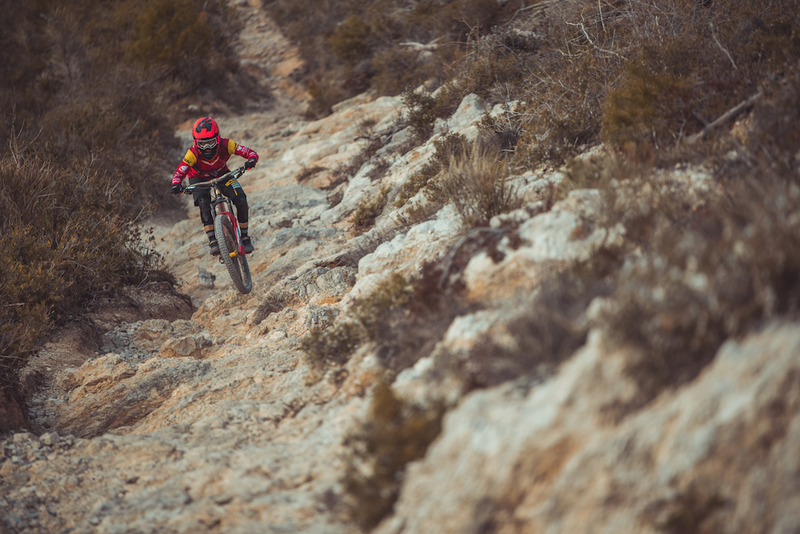 They were developed as part of the Hutchinson Racing Lab research project, and Intense Mavic Collective racer Isabeau Courdurier has won the first two rounds of the 2019 EWS aboard the new tires. Hutchinson’s new Racing Lab collection is a collaboration of the brand’s tire designers and engineers working with sponsored pro riders in an effort to develop new products through prototype testing, sharing technical information, and going back to the drawing board to improve current tires and create all new designs. The Griffus Gravity is the first Racing Lab product. Hutchinson began making bicycle tires in 1890, and as the only tire manufacture based in France has created a long Tour de France legacy. Its base was and still is Chalette-sur-Loing, near Paris. And though it has Asian partners, the brand remains a fully French operation. Little known facts are that the brand was founded by an American named Hiram Hutchinson who moved to France in 1860 to make rubber shoes and boots (think what you wear at cyclocross races). And if you check out the original facility near Paris that’s still in operation, some of its architectural stylings may look familiar. Indeed, there’s a bit of Gustave Eiffel’s handiwork (yes, that Eiffel) that still stands today after he helped rebuild the factory roof when it caved in. Of course Eiffel later went on to design and engineer construction of the Eiffel Tower. According to Hutchinson, this new Racing Lab tire was created out of a demand from its sponsored racers for a dry conditions tire to complement the wet terrain Toro and the mud specific Dzo. A 2.5 front and 2.4 rear is the optimal choice, according to team racers on the EWS circuit. The Hutchinson Griffus Gravity is a high speed, fast roller with maximum braking ability in dry, skiddy, and rocky conditions. 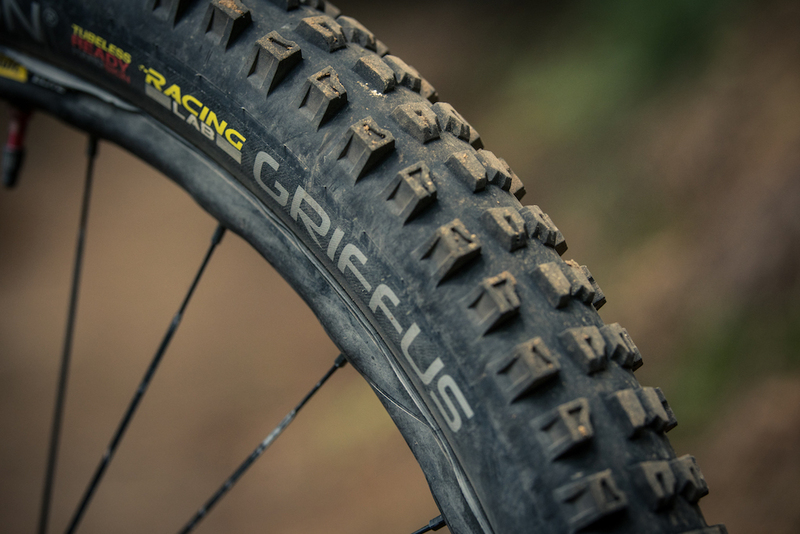 Options include 27.5 and 29er in 2.4 and 2.5 widths with Hardskin reinforced, 66 TPI tubeless ready casing. They are also available in tan wall. Mtbr’s 29er test set of one 2.4 and one 2.5 both weighed 1101 grams each on the home scale. Price is $80 for all sizes. The 2.4 is considered to be the faster roller, while the 2.5 has thicker, higher knobs for stronger cornering and braking grip. Most team riders on the enduro circuit use a 2.5 up front and a 2.4 on the rear. Courdurier confirmed this and said she even used the exact same tires for the first two EWS rounds, which she won. Courdurier also said that for especially technical courses she may opt for a 2.4 front and rear for better pedaling prowess, while she’d choose the 2.5s for smoother, high speed races. 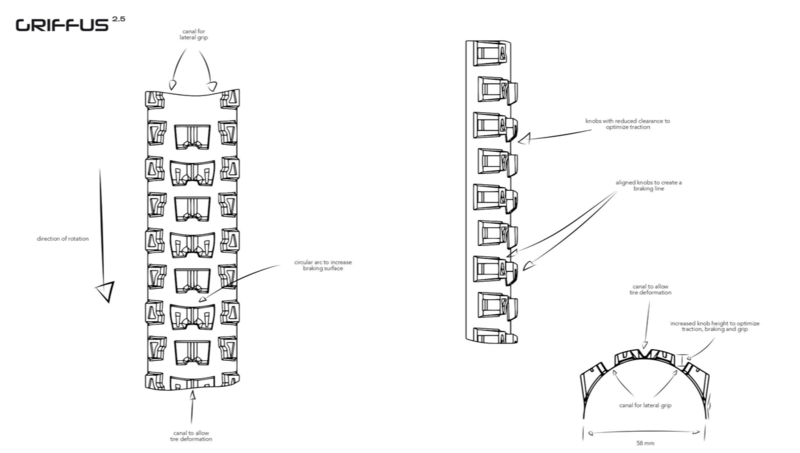 But ultimately, the mixed combo with the higher volume tire in front is the go-to set-up. Hutchinson’s objective was to develop a gravity tire with the fastest rolling performance and best lateral grip in every type of dry and hard pack terrain. Our test session was limited to just over half a day at the famous EVO bike park in Digne-les-Bains, France, which coincidentally is just a few miles from Courdurier’s home. The normally desert-like area had a freak rainstorm roll in on the day we were there, but during the morning it was dry and dusty. 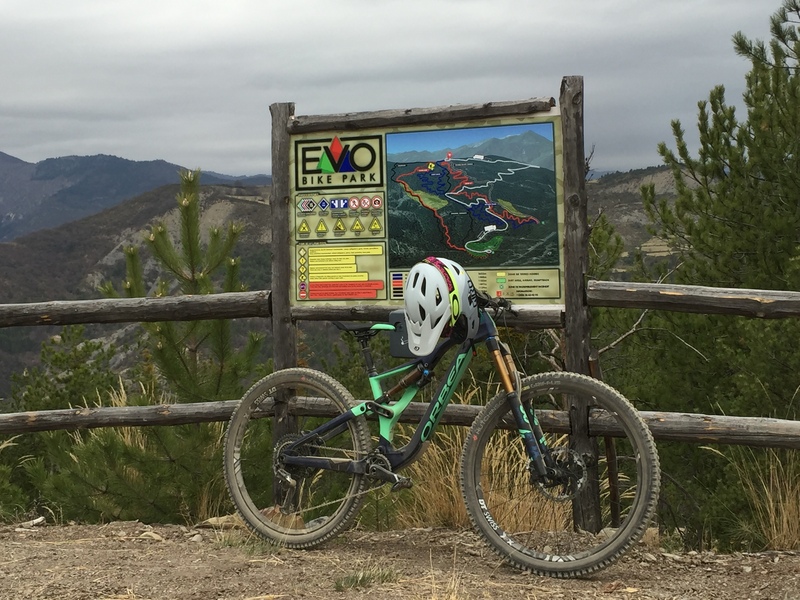 With time short, I focused on trails with larger bermed turns, steep chutes, and quick turns. Initial impressions are that these tires hook up in the dry sand and dust where I wasn’t expecting to feel solid cornering traction. Braking prowess was grippy and trustful dropping in towards a turn and railing out towards another corner on serpentine sections. 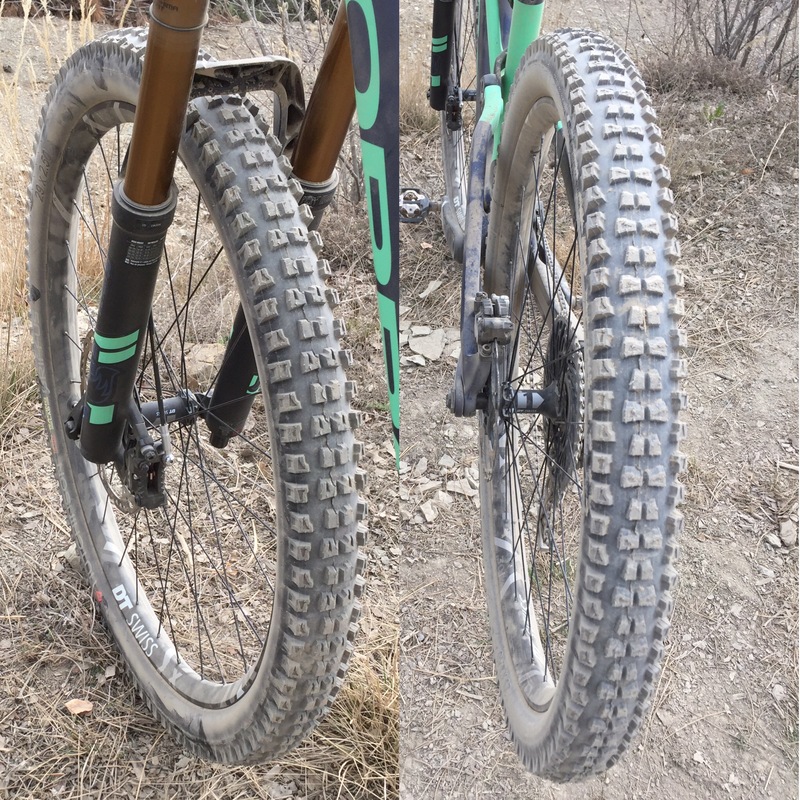 Take this with a grain of salt since ride time was very limited, but I ended the day feeling confident recommending these tires if your riding style and terrain suits its design target. It is a true dry conditions tire that based on initial testing works very well. If you’re at Sea Otter visit the Hutchinson booth for the official launch and to check out the rest of its tire line. And for more info roll over to www.hutchinsontires.com. A 2.5″ front and 2.4″ rear is the optimum choice according to team racers on the EWS circuit.